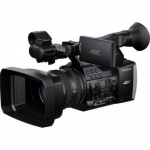 The Sony FDR-AX1 Digital 4K Video Camera Recorder is the first consumer 4K video camera from Sony. They've used the technology developed for their professional video cameras to create a compact, easy-to-operate 4K consumer model that's designed to make 4K video and professional-quality audio available to the masses. The FDR-AX1's powerful image processor is identical to the high-performance processors found in Sony's professional video cameras. By incorporating an image processor that can handle 4K video at 60 fps into a consumer camcorder, everyone will be able to document important family moments, get creative with friends, record sporting events and capture the world around them in lifelike detail. The FDR-AX1's native 3840 x 2160 4K resolution enables you to create movies with four times as much detail and quadruple the image quality of a Full HD 1080p camcorder. Plus, this model features a back-illuminated 8.3MP Exmor R CMOS image sensor that works in concert with the processor so you can record at the maximum frame rate - even when shooting 4K video. This means that even your high-speed action shots and sports videos will be clear, sharp and detailed. In order to provide 4K video recording in a consumer model, Sony designed the FDR-AX1 to support the XAVC-S 4K/HD recording format which is usually reserved for professional applications. However, since the XAVC-S codec will save as an MP4 wrapper, you can still create web-friendly videos that can be easily shared on social media sites like YouTube. Another highlight of the XAVC-S recording format is its ability to record images at 150 Mbps in 4K. In fact, it can record images at 50 Mbps even when you're shooting in Full HD 1920 x1080 resolution. The FDR-AX1 has also adopted a more professional-type of recording media thanks to the inclusion of dual next-generation XQD media card slots. Both XQD card slots support fast 4K/HD writing and reading rates. Plus, you can use the relay recording function to switch between XQD slots and lengthen your recording time. You'll also be able to quickly transfer footage via SuperSpeed USB 3.0 from your XQD cards to your PC by using an optional XQD reader/writer with a USB 3.0 connection. Another feature that makes the FDR-AX1 a professional-class consumer video camera is its audio recording capability. It records 2-channel Linear PCM audio with a built-in high-performance stereo microphone. However, the camera also features dual integrated professional-class XLR audio inputs for connecting external microphones. You'll even be able to mix audio tracks from the internal microphone with the audio recorded from any connected external mics. There are a variety of shot-enhancing functions and manual control options as well. More experienced videographers will be able to take advantage of the independent zoom, focus and iris rings. Plus, the camera's viewfinder and LCD monitor employ Peaking, Zebra and Center Marker functionality for more advanced shot setup and autofocus options. Other image-enhancing features include three ND filters and five unique Paint functions, which will help you achieve a more cinematic aesthetic with your movies. The FDR-AX1 has flexible connectivity options as well. Besides the XLR audio inputs, the camera is equipped with a headphone jack, an HDMI output that will transfer 4K footage to compatible 4K Bravia TVs, a USB 2.0 port for fast data transfers, an analog A/V output, an accessory shoe and more. With the flexible connectivity options, professional-class features, 4K recording capability and ease-of-use, the FDR-AX1 bridges the gap between consumer and professional-class. While experienced videographers will be able to really produce great video and audio with this model, even ambitious beginners will be able to master this camera and capture professional looking, cinematic 4K video with ultra-clear stereo audio. This model supports 4K 3840 x 2160 resolution. With four times better than Full HD 1080p image quality, you'll be able to capture the finest details at high resolution and produce vibrant, realistic images. Plus, the fast image processor is the same one employed in professional Sony models, making it possible to record 60p movies at the camera's full resolution for smooth playback with no loss in realism - even when panning the camera and shooting moving subjects. The Sony G Lens is an aspheric lens with special low-dispersion glass. It's specially tuned to capture subtle qualities of definition and color. In addition, the lens offers a broad 20x optical zooming range with a 31.5 - 630mm (35mm equivalent) focal length that enables an expansive range of video expression. Sony's unique Exmor R CMOS sensor has a back-illuminated structure with wiring layers on the back of a photodiode (light receiving element) that dramatically boosts low-light sensitivity for shooting more lifelike images - even in dim lighting. This Sony technology also makes the camera nimble, so it can read massive 4K data at 60 fps. The FDR-AX1's image processor is identical to those in 4K camcorders used by professionals. It rapidly processes signals transmitted from the CMOS sensor and finalizes images. In processing the vast 4K data in real-time at 60p, the processor achieves four times the resolution of the Full HD 1080p format. This processor also features high-performance noise reduction for truer images, while image quality adjustment functions support greater freedom of expression. It is also specially tuned for the FDR-AX1 to deliver accelerated image processing performance. The FDR-AX1 records 4K/HD movies in the XAVC-S codec, which was developed for consumer usage based on the professional XAVC 4K/HD codec. XAVC-S uses MPEG-4 AVC/H.264 long GOP for video and LPCM for audio compression, while saving files in MP4 format. The XAVC-S codec also allows longer recording times within a given media capacity than XAVC, making 4K recording easier and more convenient. With the FDR-AX1, high-quality XAVC-S video can be recorded at up to 150 Mbps. Additionally, there is also an option to record high-quality Full HD 1080p video at 50 Mbps. The FDR-AX1 features two XQD media card slots. XQD media cards provide smooth, high-speed reading and writing of 4K/HD video. Plus, a relay recording feature makes it possible to lengthen recording by automatically switching between two or more media options. You can quickly transfer data to a PC as well, by using an XQD reader/writer with a USB 3.0 connection. The FDR-AX1 is compatible with S-Series, H-Series and N-Series XQD media card types. The FDR-AX1 supports playback of your recorded 4K content on a 4K TV by simply connecting the two devices using the supplied HDMI cable. Thanks to the camera's original function, you'll be able to transmit 4K/60p (4:2:0, 8-bit) signals to a Sony BRAVIA 4K TV, which is specially tuned to bring out the full quality of your 4K/60p video recordings. Even fast-moving sports and action footage will be clear and smooth. To enjoy this content on a Full HD monitor, simply change the menu HDMI output settings to 1920 x 1080. If you have a 4K monitor, you can use the supplied HDMI cable to transmit 4K/30p signals from the camera to the monitor. The FDR-AX1 supports Sony's TRILUMINOS Color technology, which allows you to view photos and movies in rich, natural colors on any TRILUMINOS-equipped television. The expanded color gamut ensures lifelike, vivid colors when you playback your recorded video and still shots. The FDR-AX1 provides two methods for connecting and transferring footage to a PC. You can use a USB cable or insert your XQD memory card into an XQD reader/writer that is connected to your PC. You can also save data from the camera to other media sources like external HDDs. Once you've download data onto your PC, you can use Sony's PlayMemories Home software to manage and play your videos. You can edit video with the XAVC-S-compatible non-linear editing software as well. After your footage is edited, you'll be able to upload and share your 4K movies on social media sites like YouTube. In addition to a high-performance internal microphone, the FDR-AX1 features two external XLR jacks for connecting external microphones that can also be used to record superior-quality audio together with your movies. You can also mix audio from recordings made using the internal microphone and externally connected microphones, respectively. The FDR-AX1 features three ND filters for adjusting the amount of light entering the image sensor from the lens. There are also four filter settings: Clear, 1/4 filter, 1/16 filter and 1/64 filter. These filters and settings give users the ability to match shooting conditions, as well as adjust the shutter speed and aperture even on bright, sunny days. There are also five paint functions (white balance, gamma, detail, skin detail, matrix) that can be combined and adjusted in the paint menu to create expressive movie styling such as cinematic looks. The FDR-AX1 was designed with two start/stop buttons. One is located on the side of the camera grip, while the other is located on the handle. This affords ease-of-use while shooting. The handle also features a zoom button that enables convenient access while shooting from low angles. There are seven assignable buttons as well, which can be programmed with functions that enable users to quickly access them without using menus. Assign functions include: Marker, Zebra, Peaking, Focus Magnifier, Auto Exposure Level, SteadyShot, Color Bars, Rec Lamp [F], Rec Lamp [R] and more. Having seven assignable buttons will allow you to adjust to varying shooting conditions on-the-fly. There are also three manual control rings on the camera for focus, iris and zoom. Shooting tools such as Zebra, Peaking, Center Marker and Guide Frame are designed to assist you in shot setup. They'll help you get the cinematic expression you are after. Zebra highlights overly bright areas with stripes in the LCD and viewfinder. This feedback helps users adjust brightness and prevent whiteout, especially on the subject. Peaking simplifies focusing by highlighting in the LCD and viewfinder the areas most sharply in focus. Users can finely adjust the peaking level and choose white, red, yellow or blue peaking to clearly contrast with the subject. By making it easier to know where the shot is in focus, this feature helps users achieve the desired manual focus setting. Determine the center of your image at a glance using the Center Marker feature in the LCD or viewfinder, while the Guide Frame works as a guide for aligning horizontal and vertical lines.